Picnics are a super fun way to spend the afternoon — just pick a beautiful location, throw down a blanket, and munch away with family or friends. Here are a few healthified and fuss-free picnic ideas for your next outdoor feast! Is there anything better than biting into a juicy watermelon on a hot summer day? To make this dish, simply cut watermelon into bite-size cubes and then toss with salt, pepper, and lime juice. Then, fold in a few basil leaves and cubed feta cheese. Need more flavor? A drizzle of balsamic vinegar totally elevates this summer salad! Spring rolls are an easy nibble that you can customize to your taste preference. In this recipe, I show you how to create your own rolls. But, if you don’t have time and can’t be bothered then just use rice paper! I grew up eating tuna sandwiches and the memories of that creamy, salty taste are so strong that some days I crave it! (PS avoid regular consumption-I just had to detox from mercury poisoning) Nowadays when I do eat tuna, though, I swap the mayo for avocado and I pack romaine hearts instead of the bread. Get my “adult” version here. Nothing says picnic fun more than food on a stick. 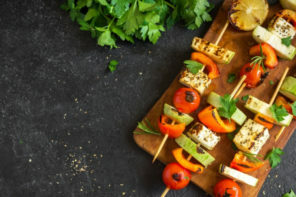 Grab a pack of skewers and thread your favorite veggies. Try cherry tomatoes, colorful peppers, cucumber chunks, and crunchy radishes. Pack dressing in a small and deep Tupperware for dipping! Here’s another fun on-a-stick idea. Layer a cherry tomato, sliced round pickle, lettuce, cheese cube, and a mini beef burger or tuna burger on a stick. Bring ketchup and mustard packets along in your picnic basket to add an extra flavor kick. If you’ve scrolled through the list of free recipes here on my blog then you’ve probably noticed that I’m a fan of stuffed lettuce cups. I have a recipe for chicken cups, beef cups, and salmon cups. Each recipe is paired with a different tantalizing dressing to balance out the flavors. But don’t feel limited to the ideas I’ve shared here. Play around to create your own version. Cauliflower is one of my favorite veggies because it’s super versatile and can taste amazing when prepared well. For a healthier picnic salad, try this low-carb recipe by fellow food blogger Buns In My Oven. Okay, so this isn’t so out-of-the-box. But no good picnic is complete without chips and dips! Opt for a better-for-you baked chip option. Then, in small airtight containers, pack a variety of dips such as guacamole, hummus, and pesto. One day I found myself with some of my leftover Mango Salsa in the fridge, a bowl of strawberries and a houseful of thirsty friends….